Coming right on the heels of yesterday's post about proof, souls, and always keeping in mind the possibility of being wrong, a friend of mine sent me an interesting story about something that happened to her last week. Here's the story, quoted directly from her email to me (and used with her permission). Keep in mind, as you read this -- although you'll have to take my word for it -- that this friend of mine is one of the most intelligent, rational individuals I know. 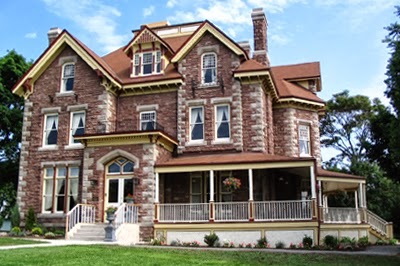 I was driving to Tim Horton's after dropping off [my son] at school, and I have to pass the lovely Keefer Inn. I always look up at it as I pass. Today, there was a man standing on the right hand side of the road, dressed in an old brown suit with a funny tie and leaning heavily on a cane. Sour face, kinda chubby. Dour. He stared at my car as I passed, so of course I stared back. Then I checked my rear view mirror. Didn't see him. So I craned back to see if he was in my blind spot. Not there. Not anywhere. So on impulse, I pulled into the nearby arena drive, parked, and scanned for where he could have gone, keeping in mind he needs a cane. I supposed he could have ran quickly behind the other house, but why would he? So I drove back up the hill, and saw no one. George Keefer's picture is in there. 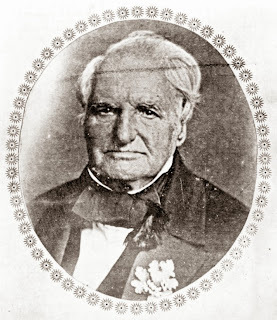 He's the original owner, was a Captain in war of 1812, EXACT SAME GUY. Did my friend see a ghost? As a skeptic, we have to admit that possibility. It certainly is a suggestive story, and I've heard many others like it -- although this is the first time that I've had one from a trusted (and rational) friend. [And Keefer's] face is also on the website, and I know I've scanned that site in the past, so I could have seen him and just filed that away. But for about two seconds there... I ALMOST believed I saw a ghost this morning. OH, I forgot the BEST PART. I was driving in my driveway after seeing him, and Pearl Jam's "Rearview Mirror" came on the local station, and I hate that song, but I burst out laughing. It was too perfect. I'm using it ALL in book 3. I just think it's amazing what the human brain can do when your subconscious knows what you want to see. How it can just make connections and go, "well, I could show you anything right now, but I'm going to choose George Keefer out of your memory banks from that one time you might have glanced at his pic in passing, and throw him in time-appropriate clothing, and then make him vanish." And for (estimating here) a good five minutes, my heart was pounding so hard, and my whole world view went WHOMP to one side, like I had the answers at my fingertips. I was very disappointed to unravel this riddle. Now, before you say, "Well, of course she perceives the supernatural -- she's a horror writer! ", allow me to point out that my novels are about the paranormal, too. I've found that paranormal writers are often skeptics, in fact. We're very clear on the fact that our works are shelved on the "Fiction" aisle. Even H. P. Lovecraft was an ardent rationalist -- he used to respond to people who wrote to him with earnest letters about how they'd found the ruins of Innsmouth and Dunwich and were descended from Obed Marsh with the curt response, "I'm sorry to have to point this out, but my stories are works of fiction. I know this for a fact, for, you see, I made them up myself." But still, the possibility remains that A. J. saw something real as she was driving past the Keefer Mansion. And that others who, like her, report running into spirits, have also somehow seen the remnant images of the dead. If we're being honest with ourselves, we have to weigh all possibilities -- that the human mind, with its flawed perceptual apparatus, imprecise processing ability, and plastic memory systems, has created something because we were primed to see it; or that what we are seeing is something that has a real, external existence, albeit one that science has yet to detect. If I didn't have a background in science, I'd have absolutely considered this a ghost sighting. Especially after Googling Keefer and seeing the same face staring back at me. My mouth went dry. It was SO MUCH FUN. But I'm telling you right now... if I see him again? That's it. I will be forced to have some serious thoughts. I'm a closet want-to-believe-er. I really really really want to think that was George. My doubts prevent it. And if it ever DID happen, I'm not sure I'd handle it well. Maybe we're skeptics because the possibility of ghosts is too scary? Science as security blankey. Or teddy bear. Oh, and I'm going to stay at Keefer Mansion soon, in this guy's own bedroom. Then we'll see, won't we? Yes, A. J. That we shall. Make sure you bring your blankey along -- and your skepticism. Given how suggestible we all are -- even us skeptics -- you may find that you need them. Sorry, you get an "F"